The blockchain industry is growing by leaps and bounds and with the appearance of this technology, startups have come searching for a new way of crowdfunding their projects: Initial Coin Offering (ICO). One of the current scalability problems of this industry is the access to purchase many ICO tokens, mainly because current purchase interfaces are difficult and complicated to use, added to other obstacles such as lack of information, payment facilities and token storage. Eidoo platform is an effective ‘blockchain-to-human interface’ that simplifies the interaction between users and blockchain-based assets, providing a new, intuitive, easy and safe way to store, buy, sell, transfer and exchange tokens and cryptocurrencies without relying on any central authority. Eidoo has an ICO Engine tool that allows third-party ICOs to join their platform where they can participate in token sales by purchasing tokens, read info about ICOs, message other users and send support tickets. Users will be able to purchase tokens by using Ethereum and, soon after that, other payment methods too, such as Bitcoin, Bitcoin Cash, Litecoin, Dogecoin, Decred and Fiat currencies (EUR, USD, and CHF) thanks to a deal made with the Swiss exchange Bitmax. From the startup side, Eidoo offers a variety of services including legal assistance, smart contract creation, KYC, marketing strategy and more. 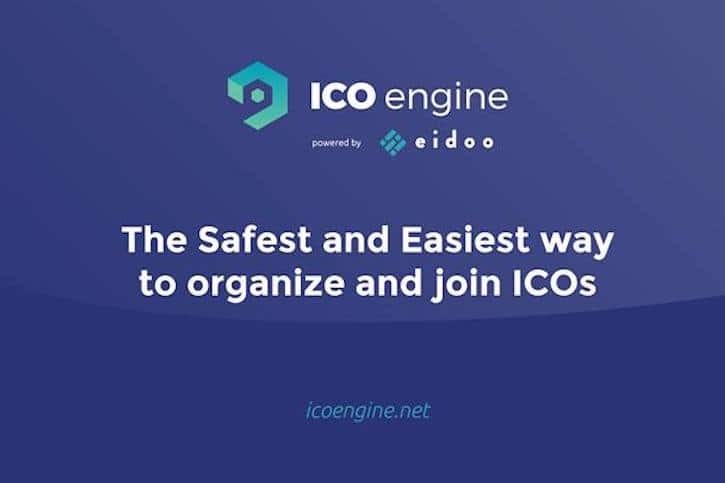 To be part of the Eidoo ICO engine, the company or startup fills out a form so Eidoo can check all the information related to the ICO and approve or refuse the request, according to the evaluation they make. Eidoo studies ICOs very carefully to make sure they only include those of a high standard according to several criteria: token usability, whitepaper, marketing strategy and team. Visibility: organize the ICO through a user-friendly platform, with more than 5,000,000 monthly unique website visitors and an app with more than 200,000 downloads. Safety: the strongest security system to ensure the safety of the company’s funding. Marketing: ICOs can take advantage of the Eidoo strategic potential and the visibility of its advertising channels around the world, explicitly related to the blockchain tech and in internationally influential publications such as The Wall Street Journal and Forbes. Tested: the ICO Engine has already been used by them to organize the successful token sale of Eidoo and other ICOs such as ETHLend. Tier 1: up to 3,000 CHF per year. Tier 2: up to 500,000 CHF per year. Since Tier 1 is mandatory to have all Eidoo services, users will need to fill out the application and this process should only be completed once. A safe and simple process to select an ICO. There are already a few projects that plan to launch their campaign through Eidoo ICO Engine. To read more about the details of this project, their goals, ideas and the money they want to raise please visit Eidoo’s website. Remember that Eidoo does not take any liability for the ICO itself; only the investors themselves will determine if they wish to participate or not. Abel is a Fintech enthusiast experienced with blockchain technology. With a BBA and a master degree in e-commerce, he combines his passion writing about the Blockchain Industry, Cryptocurrencies and Fintech. When he is not working, he loves playing online games.